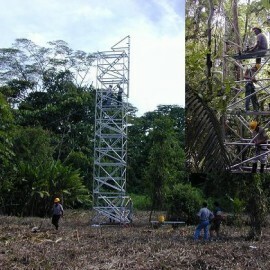 This month we bring you three examples of how Instant Observation (Stairway Type) Towers and Spandeck Walkways are providing access as Observation platforms for ecological studies in tropical rainforests. 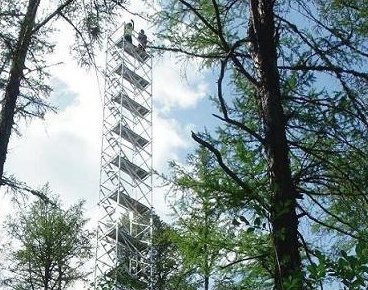 In 2009, Instant was approached to supply an alloy tower for ecological research studies taking place in Yakutsk, capital of the Sakha Republic in East Siberia. The study to estimate C02 and CH4 levels would take place in the rain forest at the southern part of the Lena River. 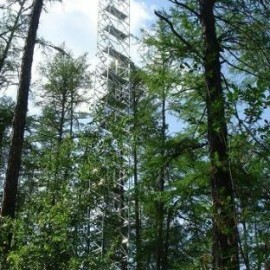 The tower itself was 32m (66ft) in height. The structure consisted of eight anchors and four guy levels with a total guy length of 427m. Given the location, a key design criteria was the ability for the structure to handle icing and to withstand local winds. Normally the design requirement for a tower like this is to be able to withstand 100mph wind speeds – even when the structure is covered with ice (which has a significant impact on the structural loads). In addition to the standard tower we often get requests to determine the impact when antennae or instrumentation is added. For this particular project, the time of the delivery was crucial to ensure we got the tower to the location and assembled while the weather was favourable. 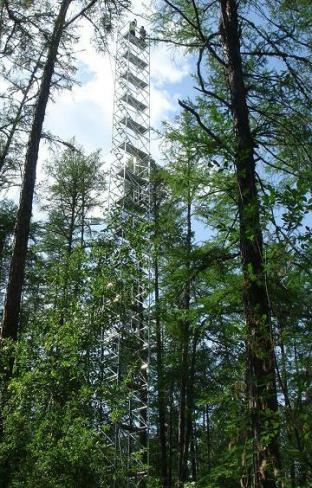 When asked why the Instant Tower had been chosen, Professor Takeshi from Nagoya University responded “cost was significantly less than the Japanese product and Instant UpRight has a great reputation for supplying reliable products to the eco-research industry”. One of the most important sites in the world for research on tropical rain forest, La Selva is a private biological reserve and station. 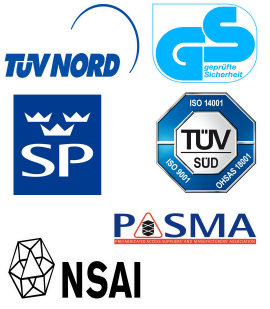 Over 240 scientific papers are published yearly from research conducted at the site. It averages 4m (over 13ft) of rainfall that is spread rather evenly throughout the year. La Selva was originally established in 1954 by Dr. Leslie Holdridge as a farm dedicated to experimentation on mixed plantations for the improvement of natural resources management. 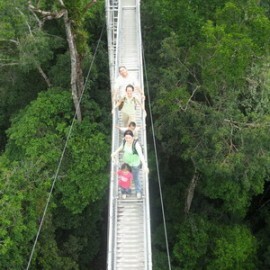 La Selva was purchased in 1968 by the Organization for Tropical Studies. 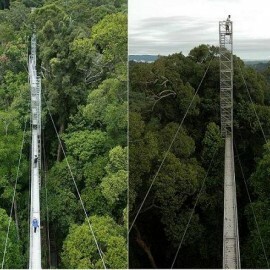 The Instant Towers were 85m high (180ft). Adding to the complexity of this project was a requirement for a walkway to be installed between the towers 56m above the ground (120ft). Fortunately, our Spandeck product fitted the bill nicely. 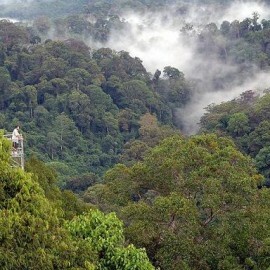 Accessible only by boat, the Kuala Belalong Rainforest Field Studies Centre is located in the Temburong forest of Brunei’s first National Park – “Ulu Temburong National Park”. Serving the most diverse eco system in the world today, the park covers some 50,000 hectares of exotic mangrove forests and provides an important insight into the bio-diversity of the flora and fauna. 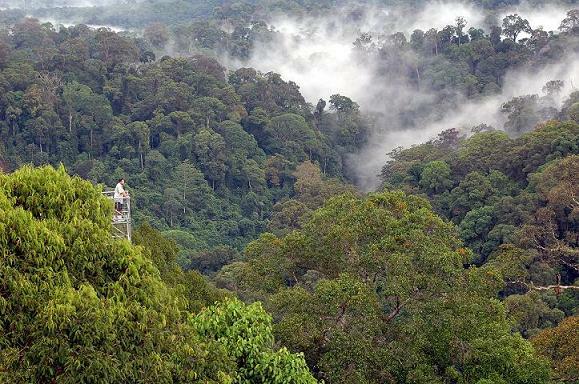 Recently, 25 hectares of the Kuala Belalong area was allocated for joint venture research projects conducted by the University Brunei Darussalam, Kuala Belalong Field Studies and the Smithsonian Tropical Research Institute. 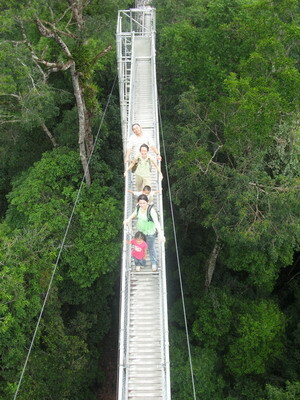 It is called the “Belalong Rainforest Experience,” and is funded by The Hongkong and Shanghai Banking Corporation: Brunei. 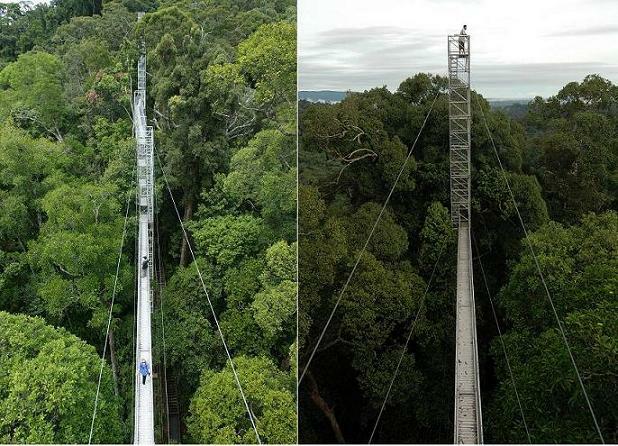 Instant Stairway Towers and Spandeck Walkways are providing the scientists access to carry out their research and offering visitors an unforgettable view of the rainforest from a Canopy Walkway which rises 60 metres from the ridge top to above the tree tops. Stairway’s one-piece folding tower sections are easily erected, fitting one on top of the other to form capacity towers with heights from 18 to 300ft. 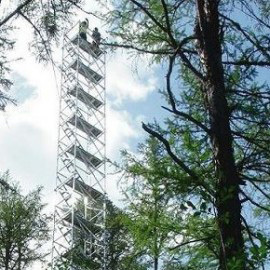 The Stairway Tower can be used for temporary or permanent installations providing a versatile, virtually maintenance free solution for access at height. 126ft Instant tower on the Distant Early Warning (DEW) Line. Two huge warning horns, sixteen corner antennas and the 24ft long trussed supporting structure are mounted on the tower. 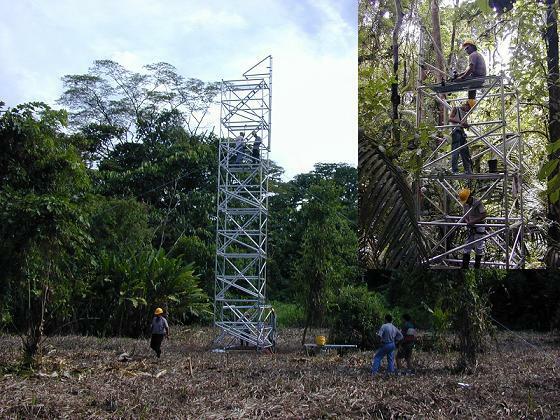 300ft Instant Tower provided high-speed easy assembly for path loss testing or full service restoration in case of attack, sabotage or disaster. 204ft tower supported meteorological instruments mounted on outboard instruments booms.